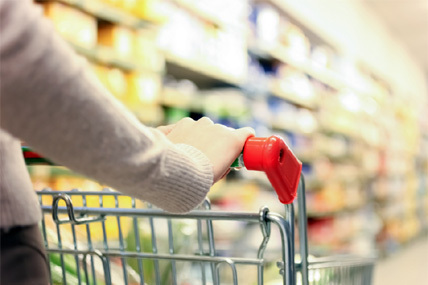 Kantar Worldpanel’s latest figures for 12 weeks ending 2th December 2016 in China shows consumer spending on FMCG grew by 2.2% compared to the same period last year. Modern trade grew by 0.5% whilst eCommerce grew by 50% for the same time period. RT-Mart is losing penetration at national level but this is mainly happening in provincial capital and prefecture level cities. In county level cities and counties RT-Mart is still recruiting new shoppers. RT-Mart has also managed to grow its shopper’s trip spending, especially in higher tier cities with the retailer’s trip spending in latest 12 weeks reaching 97.8 RMB, compared to Wal-Mart’s 102.8 RMB. This also shows us that there is still potential for RT-Mart to grow their shopper’s basket spend. Yonghui’s fast development is mainly driven by the West and South regions, where RT-Mart is not very strong. In the West region Yonghui’s consumer spending grew by 35%, whereas market leader Wal-Mart only grew by 2.3% which is slower than modern trade in the West which grew by 2.9%. Regional players are growing steadily in the South where WSL group and Bubugao grew by 21.7% and 15.5% respectively, mainly driven by penetration gains. Every year the period covering the now famous Double 11 festival lifts ecommerce penetration to a new level which will also be maintained for the following year. The latest 4 weeks data ending 2th December 2016 shows the latest Double 11 festival bringing ecommerce penetration to a new record high at 20.5%. 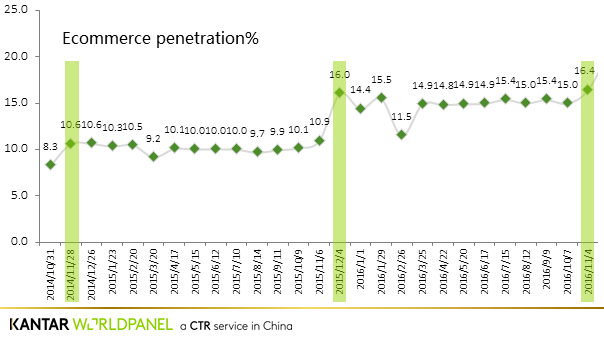 Actually, ecommerce penetration started to gain momentum even before November 2016 which was because Tmall started heating up the event even earlier than previous years. Also some of the Taobao stores ran promotions even before the event to lock in consumer spending to avoid directly competing with the big stores on the actual day of 11/11.